We design and assist with the manufacturing process with custom interior dunnage. These consists of Corrugated paper and Plastic inserts, Thermoformed Plastic inserts, Injection Molded Plastic trays, die and waterjet cut foams – just to name a few. Many times the dunnage needs are unforeseen and need to be created on short notice. With a diagram and dimensions we can in some cases supply a Rapid Prototype within 48 hours. All products can be custom designed to protect your products and reduce your cost! 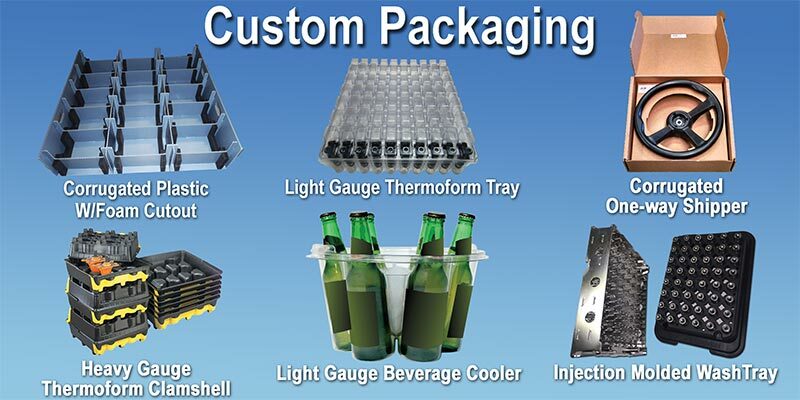 Your custom packaging arrives assembled and ready to use. No set up time required in your plant – simply unpack pallet, pack your finished goods and ship. 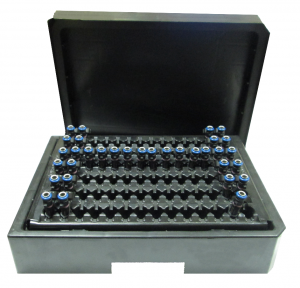 Expendable light gauge thermoformed injector tray for one way shipping. This product was designed to hold these injectors in place for transportation to the various manufacturers throughout the United States, Europe and Mexico. This was designed to accommodate several different models and generations of this product to keep costs down. Injection molded tote for light gauge injector tray. 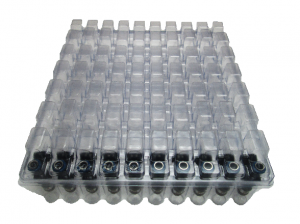 This case is designed to be stacked on pallets for shipping to domestic and overseas manufacturers. The manufacturers name, part number and shipping address is stamped on the outside as part of the vacuum thermoformed process. 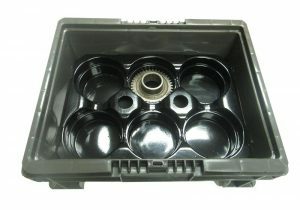 Heavy Gauge Thermoform Gear tray designed to fit in an automotive manufacturer’s tote. 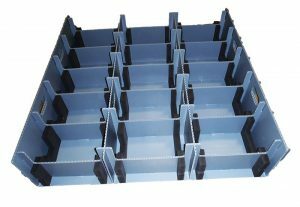 We designed this tray with a low profile to maximize the number of trays that could stack in the tote. The trays stack if needed to space for the return trip in this closed loop supply chain.